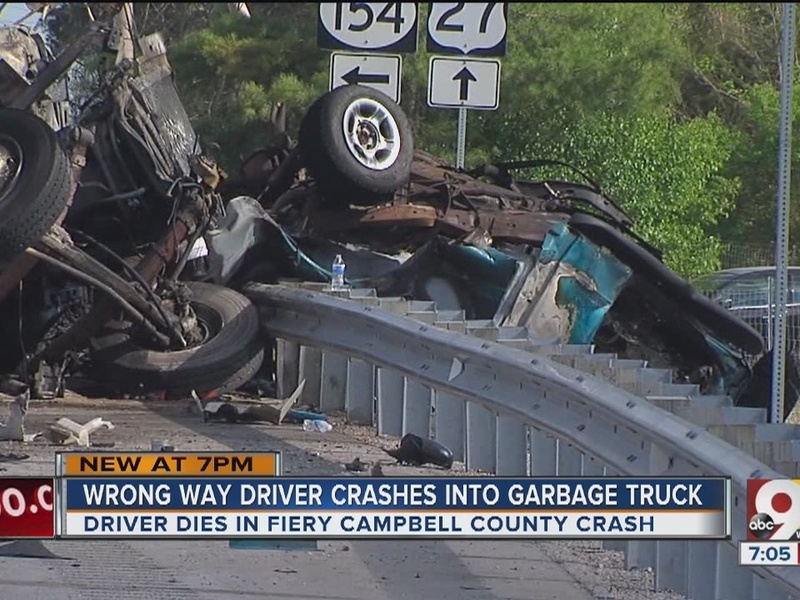 CAMPBELL COUNTY, Ky. -- A wrong-way driver and Rumpke truck collision led to a fiery crash on Highway 27 near State Highway 154, police said. Investigators said the driver of a pickup truck was traveling north in the southbound lane of U.S.27. The pickup collided with a Rumpke sanitation truck that was traveling south in the same lane at around 3 p.m. Monday. The two vehicles "subsequently burst into flames," Campbell County Police Chief Craig Sorrell said in a news release. The pickup truck's driver was killed at the scene, police said. "There was no time," neighbor Bonnie Hurst said. "I ran back into the house and called 911, but it was all over with. It was sad." Hurst said she could hear metal hitting concrete while she was inside her kitchen. When she came outside, she said, the wreckage quickly burst into flames. "I kept saying, 'Oh my god.' I mean, I just couldn’t believe this," she said. "I am glad I was in the house and not out here." The Rumpke driver suffered non-life threatening injuries, police said. A Rumpke representative at the scene of the crash said their driver involved in the crash is experienced and has worked for the company for more than 20 years.